Peter Blood is a physician and an English gentleman who becomes a pirate out of a rankling sense of injustice. Barely escaping the gallows after his arrest for treating wounded rebels who were fighting the oppressive King James, Blood flees England and becomes enslaved on a Barbados plantation of buccaneers. When he escapes, no ship sailing the Spanish Main is safe from Blood and his companions. Abounding with adventure, color, romance, and strong social commentary on the evils of slavery and the dangers of intolerance, this classic adventure is a story about how oppression drives men to desperate actions, how fate plays a hand in everyone's life, and how love is ultimately the greatest power of all. Rafael Sabatini (1875-1950) was born in Italy to two opera singers, and often joined his parents on their professional tours of Europe. In 1918, he became a British subject and worked for the British Intelligence during World War I. He published his first novel, The Lovers of Yvonne, at the age of 27, and continued to produce numerous historical novels, short stories, plays, screenplays, and some biographies. 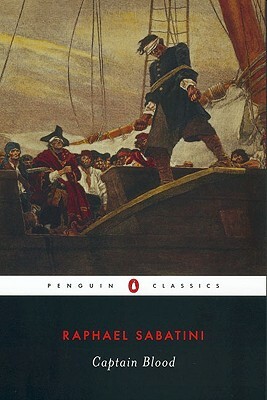 Scaramouche was first published in 1921, followed by Captain Blood in 1922. Sabatini died in 1950 while vacationing at a Swiss ski resort. Gary Hoppenstand is a professor in the Department of American Thought and Language at Michigan State University. He has researched and published widely in the areas of popular culture and popular fiction studies, and he edited the Penguin Classics editions of Anthony Hope's The Prisoner of Zenda/Rupert of Hentzau and A.E.W. Mason's The Four Feathers. He is the past president of the Popular Culture Association, and the current editor of The Journal of Popular Culture.